So tonight I finally tried a new and exciting place all on my own volition. OK, well that’s partially a lie because I was going out for dinner with a friend who was in town for the week. But I picked (again, partially) the place. After scouring New York Magazine for some suggestions in Hell’s Kitchen, my new favorite stomping ground, I selected several choices, from German to Thai. Marissa, my guest, chose a spot which ended up being far more expensive than anticipated. 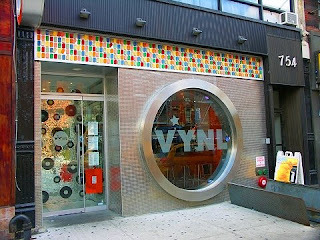 Backtracking, we fell upon Vynl, naturally the first place we passed on our excursion. Tired, hot, and wetter than a Chelsea boy’s bed on Sunday morning, we threw the door open after a quick look at the menu. We exchanged glances of “where the hell are we?” Records, beach balls hanging from the ceiling, loud music, and generally exuberant ambiance welcomed us. There was no way to get bored here. Once seated, we were greeted by a jovial waitress who took our drink orders. Grey goose, Chambord, and fruit juice? Yes, please! As we ordered our food, the waitress commended our choices, confirming the palatial palate pleaser that was to come. 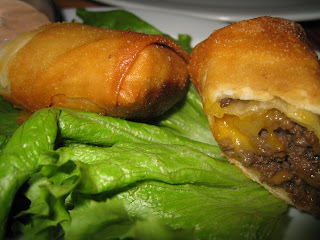 First up, a cheeseburger egg roll. Savory beef and gooey cheese inside of a fried shell – perfect. Usually I’m not extremely interested in condiments, but the ranch dressing alongside the burger roll added so many layers of flavor. Entrée – mac n’ cheese and quesadillas. 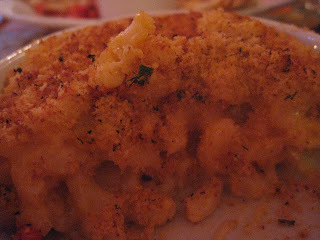 My baked mac n’ cheese was a piping hot dish of gruyere, goat (swoon), and a third cheese – I can’t remember everything. A generous helping of crispy bread crumbs was an obstacle, but once I got my fork into those little elbows, I was on my way. Meanwhile Marissa struggled through her generous appetizer portion of chicken and cheese quesadillas. The tomato salsa was refreshing with just enough spice. Filled to perfection. 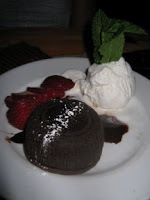 As we finished our martinis and pushed our plates away, it was dessert time. 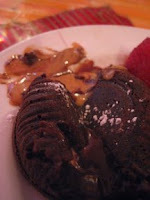 Our waitress seemed jealous as we ordered the peanut butter lava cake, the day’s specialty. As the cake came out, with large scoop of vanilla ice cream and some sliced strawberries, we weren’t really aware of what was to come. But as Marissa broke through the cake with her spoon, gooey peanut butter oozed out. The richness of the chocolate was balanced perfectly with the saltiness of the PB, the ice cream cooled it all down, and the strawberries constituted my portion of fruits and veggies for the day. Not bad for 25 bucks a head.